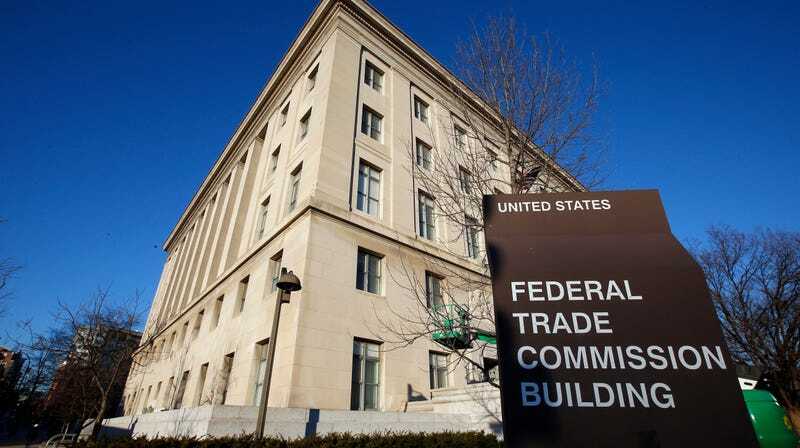 This Jan. 28, 2015 file photo shows the Federal Trade Commission (FTC) building in Washington. The orders compel the disclosure of internal documents in what’s known as a 6(b) study, which also includes dozens of questions concerning the collection, retention, use, and disclosure of information about consumers and their devices. The FTC is seeking access to, among other information, lists of third parties that have received personal information collected on consumers, as well as descriptions of how and when the providers anonymize such data. AT&T, Comcast, Google Fiber, T-Mobile, Verizon, and their broadband divisions are among the providers to receive the orders. The providers may file a petition to quash the order. If that happens, the FTC may seek a court order to compel their compliance. In January, more than a dozen U.S. senators asked the agency to conduct a “broad investigation” into the business partnerships between wireless carriers and dozens of so-called “location aggregators,” which have been implicated in the misuse of location-data originating from consumers’ devices. AT&T and T-Mobile are among the companies that reportedly allowed customer location-data to fall into the hands of, among others, bail bond agents. “It is clear that these wireless carriers have failed to regulate themselves or police the practices of their businesses partners, and have needlessly exposed American consumers to serious harm,” lawmakers wrote. The FTC’s authority over broadband providers was greatly expanded last year after the Federal Communications Commission changed the classification of mobile data to be, once again, treated as an “information service” under Title I of the Communications Act. Following the FCC’s passage of the 2015 Open Internet Order, which classified broadband providers as common carriers under Title II of the Communications Act, AT&T challenged the FTC’s power to investigate allegations of deceptive and unfair practices harmful to consumers. Notwithstanding, an en banc panel of the U.S. Court of Appeals for the Ninth Circuit ruled against AT&T anyway, finding that its “non-common carrier activity” remained subject to FTC oversight.